This story originally ran in issue 15 of The Magazine. You can now read it here by virtue of that publication’s impressively author-friendly contract. One of the Web’s most popular sites — and the exceedingly rare media property soaking up tens of millions of dollars in venture-capital financing — gets much of its content without asking permission to use it, much less paying for it. That’s not news. But if you talk to some of the people whose images wind up in BuzzFeed’s endlessly clickable and heavily clicked-upon photo galleries, you may have your expectations overturned, as mine were: most say thanks for the exposure. BuzzFeed at first looked like an appropriator that took value without returning it, irritating professional photographers who find their work both increasingly valued and increasingly used without compensation. But on closer inspection, BuzzFeed may be finding its way toward a safer course — a careful combination of conventional licensing and curatorial selection. To test that commitment, I set out to ask every source named in the January 2013 gallery “18 Microwave Snacks You Can Cook In A Mug,” one question: Did BuzzFeed ask to use your photo? First conclusion: Getting random bloggers to reply to you isn’t easy. Half of the 16 sources contacted via email, phone calls, queries submitted via contact-us forms, and, in one case, a Twitter mention never responded. Second: When large media properties are involved, BuzzFeed seems eminently capable of following the niceties of copyright law. Three of those recipes came from the St. Louis Post-Dispatch; that paper’s work is syndicated over the McClatchy Direct wire service, and editor Debra Leithauser says BuzzFeed paid to use all three photos. 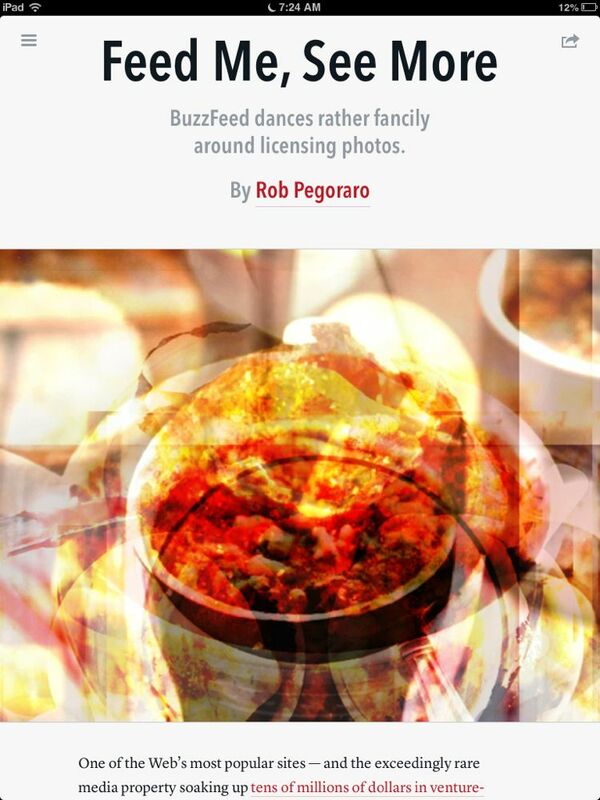 Another image came from Reader’s Digest’s “Taste of Home” site, but a publicist couldn’t determine if BuzzFeed had licensed it. Third: For everybody else, permission, much less payment, still doesn’t come into play. None of the other six sites whose images had been duplicated could document getting any reuse request from BuzzFeed. Three said they couldn’t remember (though one said weeks later that she had gotten a request but did not provide further details), and three stated with varying degrees of certainty that BuzzFeed didn’t ask. Kita Roberts, a Delaware author whose “Banana Bread In A Mug” recipe had the seventh spot in that gallery, writes that her “Pass The Sushi!” blog racked up 17,000 hits from BuzzFeed in January. The BuzzFeed link economy can look less generous if you consider online outlets that don’t let their users cash in on extra traffic. A second BuzzFeed Gallery, February’s “50 Sure Signs That Texas Is Actually Utopia,” provided a convenient test case. It featured three Flickr-hosted photos, and that Yahoo photo site clearly displays the copyright restrictions an account owner has attached to each image. Two of them fell under Flickr’s default “all rights reserved” setting, and the other bore aCreative Commons “non-commercial” license. None of these photographers had been contacted by BuzzFeed. “The only way I even found out about the photo being used was my daily check of my Flickr stats,” says Little Rock-based photographer Steve Spencer. But, he adds, “I do love the BuzzFeed galleries,” and he says he would have told them, “Sure, thanks for checking with me” if he’d gotten a request to use his photo of a filling Tex-Mex meal. Two copyright-law experts did not drop the hammer I expected on BuzzFeed. “The law has never required the kind of licensing that people have assumed is necessary,” says Julie Ahrens, director of copyright and fair use at Stanford University’s Center for Internet and Society. One problem with this reading of copyright doctrine is that individuals and smaller operations, with fewer resources to pay lawyers, may not be able to employ fair use as a defense in the way BuzzFeed now can. There are enough ways for even a well-justified case to go against somebody asserting fair usage that the producers of the comic-strip documentary Stripped wound up asking in a second round of crowdfunding for $34,000 (and raising nearly $76,000) to license a small percentage of the clips and other material they wanted to include. If this emerging norm looks like a sort of regressive taxation that rewards large corporations that already profit from the system but brushes off solo bloggers with a “let them eat traffic” mindset — well, maybe it is. But for some, BuzzFeed gives a value that equals or surpasses what it takes. This entry was posted in Journalism, Photos, Social media and tagged BuzzFeed, copyright, fair use, Flickr, food blogs, intellectual property, The Magazine, transformative use by robpegoraro. Bookmark the permalink.